Boss Dean Austin has promised the Cobblers supporters that he and the players will be ‘scrapping to the end’ to try to ensure they are still a Sky Bet League One club next season. Town travel to Walsall on Saturday looking for their third win on the spin, boosted by the midweek results of Oldham Athletic and Rochdale that have left the fight for survival wide open. 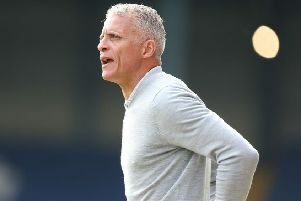 Just two points separate the Cobblers in 22nd place and Rochdale in 19th, and Town know they will leapfrog 20th-placed Saddlers if they can win at the Bescot Stadium, and they then entertain 21st-placed Oldham Athletic on the final day of the season. The victories over Bury and Plymouth Argyle have raised confidence and belief in the Cobblers squad, and although Austin knows there is still no room for error, he has pledged every effort will be made to complete what would be a remarkable escape. “I have spoken to the players, and said to them ‘let’s not get too carried away’,” said Austin, who was delighted with his team’s performance in the 2-0 win over Argyle at Sixfields last weekend. “We have won two games on the spin, and it is a nice feeling, and we have spoken about the feeling we had, but we have to go again. We have to turn up with the same work ethic, and to be honest it is a pleasure to work with these boys. “They are giving it everything they have got, they want to improve, they are listening, taking things on board and we are pushing forward. The Cobblers have no injury concerns ahead of the trip to the Bescot.